"While the diagnosis is common, public understanding of autism is not. The lack of understanding about the condition can make life even more difficult for children with autism. A recent study reveals that they are five times more likely to be bullied than their peers—treatment no child should endure. While it’s true there can be significant differences between people with autism and their peers, all children want the same things: to feel safe, happy, and loved. And all children have something to contribute—unique perspectives and talents that help make the world a richer and more interesting place. "That’s why Sesame Workshop created Sesame Street and Autism: See Amazing in All Children, a nationwide initiative aimed at communities with children ages 2 to 5. Developed with input from parents, people who serve the autism community, and people with autism, See Amazing in All Children offers families ways to manage common challenges, to simplify everyday activities, and to grow connections and support from family, friends, and community." The "Amazing" project started in 2015 as one in a series of projects for families with unusual circumstances. Prior characters and projects have focused on children with incarcerated family members and family members who are deployed with the military. While the project has been around for a while, Julia herself will appear for the first time on Sesame Street in April. She is a most unusual addition, as new characters are very rare. 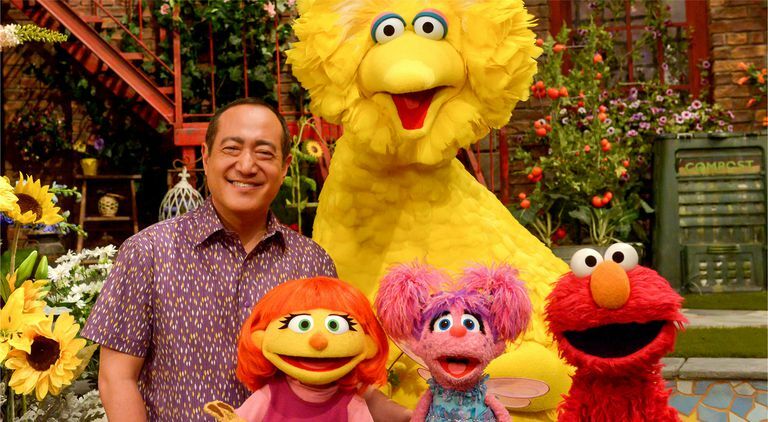 Sesame Street administrators and employees with autistic family members helped pave the way. "A team of researchers from Georgetown University is studying how effective the program has proven for families who have experienced Sesame's autism materials. The researchers surveyed more than 1,000 families, more than a third of whom have children with autism. Preliminary findings suggest the material helps families with autistic children feel more comfortable incorporating them in broader community activities, and that families whose children do not have autism are more accepting of those kids who do." Julia is a 4-year-old red-headed muppet with autism. She's a good friend of Elmo but is just getting to know the other residents of Sesame Street. It takes some time for other Sesame Street friends to understand what Julia is like, and to know how to interact with her. Most of the time, they figure out a way to engage with her in a positive way. She can speak but is often slow to respond. Her voice is flat, she sometimes echoes others' words, and she may use single words rather than full sentences. She enjoys playing with others sometimes, but may or may not respond to social overtures. This makes some members of the Sesame Street community think "Julia doesn't like me," but Elmo explains that Julia might respond when she's ready. Julia loves to sing and knows all the words to many songs. She may or may not, however, choose to sing when everyone else is singing. Julia likes painting, drawing, and picking flowers. She's quite a good artist. Julia has a favorite toy that she always carries around. Sometimes she is focused on her toy and finds it hard to respond to others. She has sensory issues that can make it difficult to be around loud music and other noises. When Allen is using his blender, she gets quite upset. Kids with autism are very different from one another—and the best way to explain those differences is to show them. Videos with real kids and parents show kids with symptoms that are mild, severe, and even aggressive. They even take the unusual step of showing kids having meltdowns while also describing those same kids as potential friends. The website includes an interactive book called Benny's Story, created by autistic adults at Exceptional Minds. The story makes it clear that sometimes people with autism really don't want to join in or be "just like everyone else." But, just like everyone else, kids with autism do want to have fun in their own way. Several of the resources and videos are intended not for families with autistic kids, but for kids and families who would like to interact with and support families with autistic members. There's a video about the importance of family friends, and a tip sheet for kids who want to reach out to autistic classmates. A short "provider guide" offers suggestions for including autistic preschoolers in "autism-friendly events." Kids with autism are often very attached to favorite TV characters—and Elmo is among the most popular. Sesame Workshop has created a large set of what they call "daily routine cards" to help guide kids through key home, community, and school activities. These are actually more like narrated social stories that can be viewed, printed, or downloaded. Typically developing kids watch Julia and short videos about real-life kids with autism to better understand autistic peers. Parents of typically developing kids watch parent videos and read tip sheets to better understand their children's autistic classmates (and their parents). Teachers read and watch videos to get ideas for introducing autism in their classrooms and suggesting ways for typical students to engage with their autistic classmates. Administrators make use of the online materials to support anti-bullying efforts, support groups, playgroups, and other school-based programs. Everyone watches Sesame Street to see that it's normal to have questions about autism, that it takes some work to make friends with an autistic peer, and that the work is worth the effort!